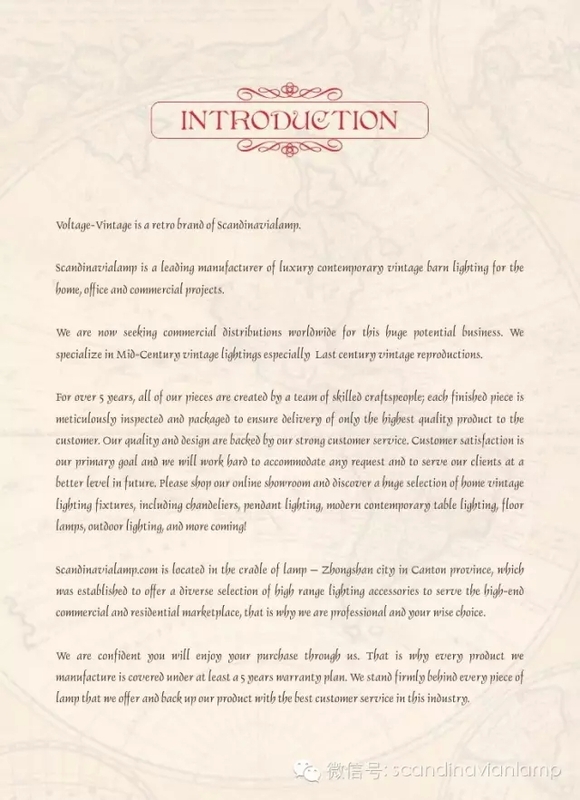 Since 2013 Scandinavian Interior had created our own R&D team and finally we have the initial selection with innovating vintage designs.The new selection were iconned as " Voltage Vintage" and the New Brand offering with an impressive selection of fixtures and accessories, from hundreds of different designs. Our robust supply of more than 600 products includes both indoor and outdoor lighting fixtures as well as the We have a great selection of interior lighting products such as chandeliers, table lamps and sconces. We also carry hotel lights,path lights and other outdoor lighting fixtures. The patent and rights are well reserved and National patent umber 201530331319.8,to make sure you will have the exclusive competitive design beyond the market. our commitment to offering a wide selection of products with everyday savings and quality service. Because we stand by our products, we offer a 5 years wrranty on every item we sell. If you don't find what you're looking for, our Customer Service department will gladly track it down for you. Quality products and excellent service, coupled with a solid pledge to customer satisfaction, makes Scandinavian Interior the smart place to buy lighting.